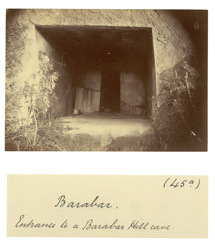 Photograph of the entrance to a cave in the Barabar hills taken by Alexander E. Caddy in 1895. The excavation of the majority of caves in the area have been both architecturally and epigraphically dated to around 250 BC, when the area was ruled by the Mauryan king, Asoka. Asoka was a Buddhist who ruled almost the whole of what we now call India in the third century BC. However these caves were used by the Ajivikas, a Jain sect which were allowed to thrive under Asoka's policy of religious tolerance. The sect believed that life was totally predetermined by destiny and practiced asceticism at locations like these caves. Along with the other cave-temples in the Barabar hills, the Lomas Rishi cave, provided a prototype for the larger Buddhist Chaitya halls that are found in Maharasthra such as Ajanta or Karli and were very influential to the tradition of South Asian rock-cut architecture. The area is also the setting for the opening of E.M. Forster's 'A Passage to India'. The Barabar caves generally consist of two chambers, the first allowing worshippers to congregate in a large rectangular hall, the second providing a focus for their worship in a small, circular, domed chamber. This inner chamber probably held a small stupa like construction at one point however they are now empty. Both chambers were carved entirely out of granite with a highly polished internal surface. The doorway depicted, imitates wooden structures with sloping door jambs.